Aloha Vista Bar & Grill is located in Keauhou, on the same grounds as the Kona Country Club. With majestic views of Keauhou Bay and dishes straight from Italy, Aloha Vista is perfect for lunch, dinner, and even happy hour! In addition, the location is right off Alii Drive with ample parking. The food scene in West Hawaii was first introduced to the authentic Italian cuisine of Aloha Vista, from the home country of Chef Giovanni Saffioti, in 2012. Together with his co-owner, Devon Drake, they brought to Kona their restaurant in an attempt to spread their culinary expertise further. This is a fresh start for the sixty year old Italian who was born in Genoa, a Mediterranean sea port in North West Italy. The region is well known for excellent Italian cuisine, but especially for its famous pesto sauce. Saffioti moved to Canada with his family in 1969, and his passion for cooking compelled him to travel frequently between Canada, Italy and America, to gain experience at various restaurants. He has studied under many chefs and slowly worked his way up from being a busboy at the age of 15, to being a Chef in his own right in 1983. During Chef Saffioti's many travels abroad, he fell in love with the island of Hawaii ,with its unique pace of life, and developed a desire to present the residents of Hawaii with something different in the line of Mediterranean cuisine. At Aloha Vista, his authentic recipes for many of the dishes that can be enjoyed at the restaurant, have been the result of his vast experience , as well as his rich heritage. His style embraces a fusion of Mediterranean and Italian cuisines and his love for fresh ingredients shows in his dishes, which are infused with authentic Italian flavor. Saffioti enjoys preparing his dishes from scratch and likes to make his own bread, pesto sauce and tiramisu the way it has always been made in the kitchens of Italy. Add: Grilled chicken: 4 shrimp 6, fish 6. Ask your server about daily drink specials! 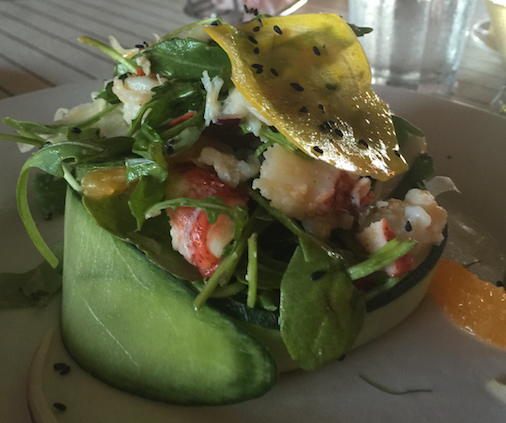 Fresh lobster wrapped with thinly sliced cucumber and fresh local produce. We look forward to sharing our authentic italian family cuisine with you. Passion & Aloha From Our Family to Yours!